Acute Cerebro-Vascular Accidents (Strokes): Ischemic strokes due to cerebral thrombosis, cerebral embolism, acute circulatory disorder, hypertensive crisis; the acute cardiovascular disorders, ischemic neurological deficit (RIND), complete stroke (CS), multiinfarete dementia, cerebral arteriosclerosis, hypertensive encephalopathy, post-apoplectic conditions with the background of hemorrhagic strokes etc. 1-2 tablets thrice daily, the maintenance dose is one tablet thrice daily. 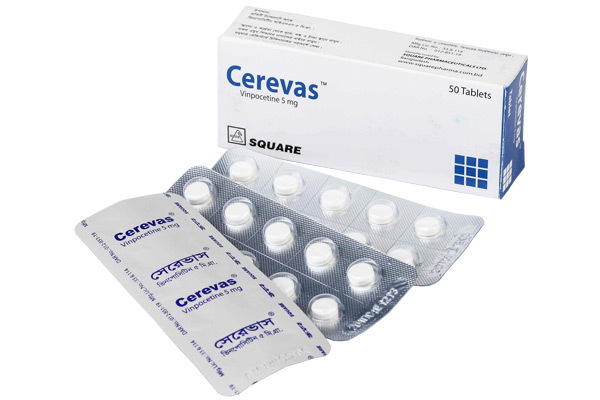 CerevasTM Tablet : Each box contains 5x10's tablets in blister packing.